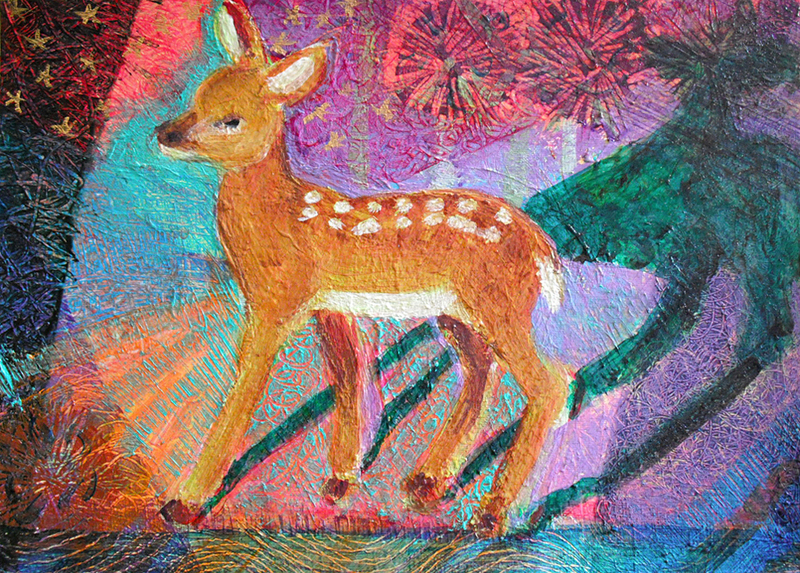 Fawn and Stars is one of my earlier paintings. I’ve always liked primitive feel and abstract look of it. The colors remind me of this time of year as the nights get longer. I’ve used the image as a winter holiday card in my Circles Round the Sun Etsy shop. It’s been a very busy season, my daughter who is in her senior year of high school, is applying to collages and recently had a German exchange student stay with her for two weeks. It was such a pleasure having her here with our family but very hectic with all their activities going on. My husband has been working nonstop for a big deadline coming up in a few days and I’ve been planning a neighborhood artist open house for December. In a few days we will be traveling to my sister’s home for Thanksgiving. I’m so looking forward to being with family and also relaxing for a bit. Happy Thanksgiving to those in the States! Have always loved this sweet paining Heni. It’s perfect for a holiday season card. Happy Thanksgiving to you too! Between the background colors and the brush work, this one reminds me of an old fashioned crazy quilt. The different colors in the background make me thing of patchwork, and the brushstrokes look a bit like embroidery. Very cool. Thank you Molly! Wow, good observation. I have a crazy quilt my aunt made hanging in my dining room, I see what you are saying! Thank you for your comment, I’m not familiar with “The Black Cauldron”. I will check it out.